Abstract: Includes correspondence, bids, contracts, materials, lists, etc. Papers pertaining to wooden steamships for the U.S. Shipping Board Emergency Fleet Corp. (1917-1920) are present, as are specifications for numerous barges and scows built by the Company during the 1920s. Letters, bills, etc.. (ca. 1857-1890), involve orders for lumber and other materials, and the management of company vessels. “The [Churchill’s Yard] was sold to S. Gildersleeve in 1828…Sylvester Gildersleeve began shipbuilding…in 1821; November 20th 1838, he purchased the Lewis yard from Abel, son of George Lewis. The first vessel built here was a sloop, the BOSTON PACKET, of 70 tons, Seth Overton, Jr., of Chatham, captain. In 1836, he built the schooner WILLIAM BRYAN, the first vessel sailing as a regular packet from New York to Texas. From this arose the New York and Galveston Line. Between 1847 and 1850, five ships belinging to this line were built at the Gildersleeve yard, the largest, 700 tons. They were named after the Texas patriots: STEPHEN F. AUSTIN, B.R. BILAN, WILLIAM B. TRAVIS, J.W. 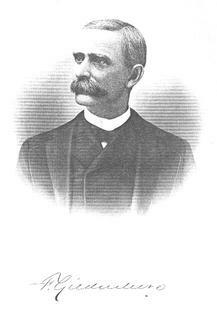 FANNING, WILLIAM H. WHARTON. 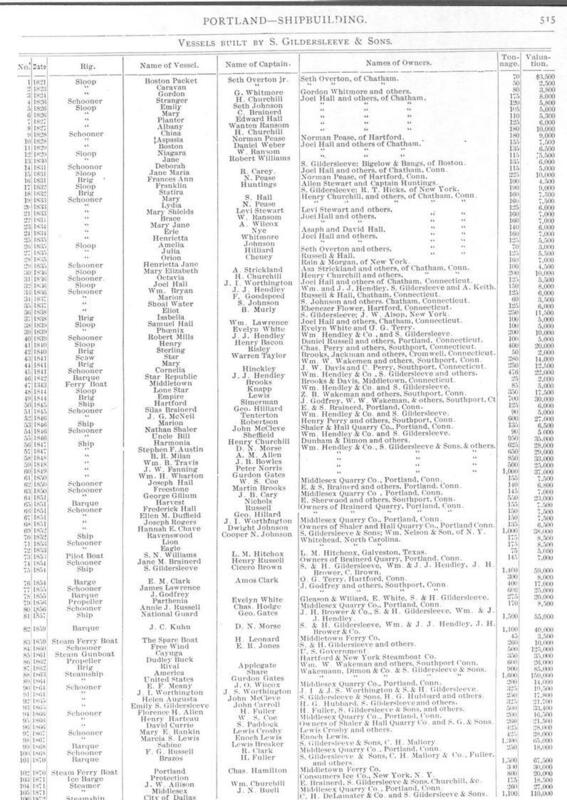 List of vessels built by S. Gildersleeve and Sons, con’t. 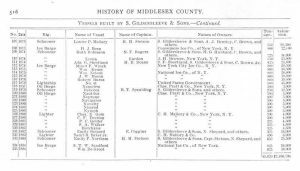 “In 1663, Richard Gildersleeve was a resident of Hempstead, L.I., and an ancestor of Obadiah, the grandfather of Sylvester, who came to Chatham from Sag Harbor, L.I., in 1776, and commenced the business of shipbuilding at that part of Portland now known as Gildersleeve. The first yard was started a short distance south of the present one. Philip, his son, the father of Sylvester, succeeded, and was master carpenter on the government ship CONNECTICUT, built here about 1800. On the 4th of May 1780, Philip married Temperance Gibbs, of Windsor, Conn., by whom he had six children: Jeremiah, born August 24th 1781; Betsey, born April 23rd 1783; Henry, born November 8th 1785; Lothrop, born December 16 1787; Sylvester, born February 25th 1795; Cynthia, born March 28th 1797. Sylvester, the subject of this sketch, was born February 25th 1785, in the little old two story red frame house situated on Indian Hill, at the northerly end of Chatham (now the portion of Portland called Gildersleeve). He attended the district school until he was eighteen years of age. he then commenced work in his father’s shipyard. This was during the war of 1812, at which time, owing to the operations of the British army in Canada, our government was engaged in constructing war vessels on the western lakes. 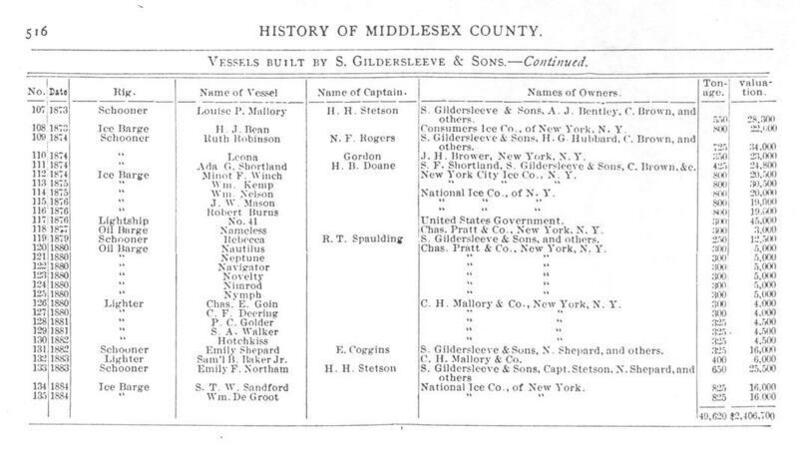 In 1815, when young Gildersleeve was but 20 years of age, he went, in company with some 500 workmen, to Sackett’s Harbor, N.Y., to build for the government a one hundred gun ship, which was then one of the largest ever built in this country – the combined fleet of Commodore Macdonough at the battle of Lake Champlain mounting but 86 guns. Two of these monster ships were being constructed at the same time. The weather was cold and the men were provided with a liberal supply of ‘grog,’ then considered an indispensable part of the rations. The ships were never completed, as the declaration of peace soon after rendered them useless, and the men returned home, some of them making nearly the whole journey on foot. “The eldest son of Sylvester and Rebecca Gildersleeve inherits from his father those rare traits fo character that have distinguished the Gildersleeves, not only as a family of successful shipbuilders and merchants, but as a family who are noted for their public spirit and large hearted benevolence. 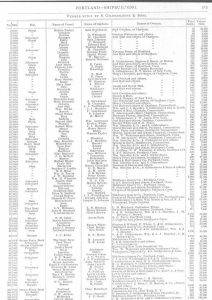 “Ferdinand Gildersleeve, the fourth child of Sylvester and Emily Shepard Gildersleeve, was born on the 20th day of August 1840, in the part of the town of Portland now called Gildersleeve. The Gildersleeves came originally from Holland, and th Shepards from England, so that the Dutch and English characteristics combine in the subject of this sketch. He attended the district school in his native village till nearly twelve, and was for the three following years at boarding school. He then, in 1855, at the age of fifteen, entered his father’s store, and soon after becoming twenty-one he was admitted to membership in the firm of S. Gildersleeve & Sons, shipbuilders and merchants. He is now and has been continuously connected and identified with the business since first entering it. The establishing of the post office at Gildersleeve, in May 1872, was largely the result of his efforts. He was the first postmaster and continues to hold the office. 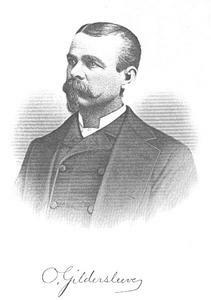 In 1879, he succeeded his father as president of The First National Bank of Portland, and held the office for two years; is now a director in the same bank, and in The Middlesex Quarry Company; a trustee and director in The Freestone Savings Bank; a vestryman of Trinity (Episcopal) Church; and for many years has been a notary public. 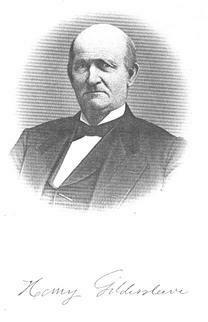 He was a member of the town board of education for several terms; has been on various committees on enterprises and improvement in the town, and trustee for school and other funds. “The eldest son of Henry and Emily F. Gildersleeve is a worthy representative of his honored sire and grandsire, a man of robust constitution and great force of character, combined with excellent business qualifications. He was born on the 6th of March 1844. He received his education at the Hartford high school, and at the age of 17 entered his father’s shipyard, where he soon acquired the art of practical shipbuilding, and at the age of 21 became a partner; since which time he has largely increased the business, having added a marine railway capable of hauling vessels of 700 tons burden, and built a large ice house, provided with steam machinery and all the necessary appliances for gathering ice from the Connecticut River, for shipment to New York and southern ports. In 1881, he became a member of the firm of S. Gildersleeve & Co., shipping and commission merchants, 84 South Street, New York, he being the active managing owner of the fleet of vessels controlled by that house, which are owned principally by the Gildersleeve family. As a young man he was very desirous of seeing the world, and at the age of 27 had visited the principal cities of his own country, Europe, and Canada. Possessing an excellent memory, he acquired a fund of information which has been utilized to good advantage in his business. In his works of charity and benevolence he has fully sustained the reputation of the Gildersleeve family. He is a junior warden of Trinity Episcopal Church of Portland, and has variously officiated as lay reader, Sunday school superintendent, and teacher. S. Gildersleeve and Son (Portland, Conn.) United States. Shipping Board. Emergency Fleet Corp.
Coll. 113, Manuscripts Collection, G. W. Blunt White Library, Mystic Seaport Museum, Inc.